Does Grindelwald count as a "fantastic beast"? We’ve finally got a first look at Jude Law’s Young Dumbledore in the upcoming sequel to Fantastic Beasts and Where to Find Them, along with a slew of new information including an official title, plot synopsis, and full cast photo. Get ready for a beast-filled, magical ride. On Thursday morning, Warner Bros. revealed all of these updates primarily through a blog post on Pottermore. 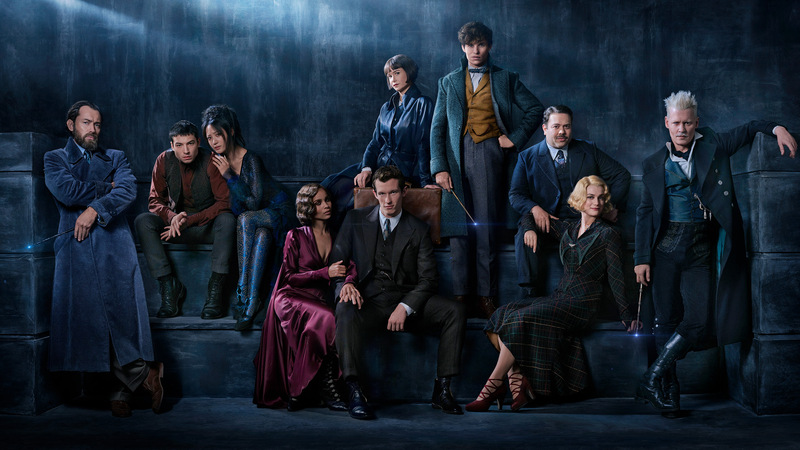 The film, officially titled Fantastic Beasts: The Crimes of Grindelwald, features the return of most characters from the first film with the much-hyped addition of Jude Law as a younger version of the famed wizard Albus Dumbledore, among others. Though much of the pre-existing cast remains unchanged — with Newt Scamander (Eddie Redmayne) sporting the same dapper blue coat — Johnny Depp’s Gellert Grindelwald has gotten a slight makeover. His attire makes him look more like a suave rogue you ought to fear, especially because he’s holding the Elder Wand. Welcome to 'Fantastic Beasts: The Crimes of Grindelwald'. The photo confirms the return of Credence Barebone (Ezra Miller), but draped over him is a currently unnamed character played by Claudia Kim who is supposedly a blood-cursed “Maledictus,” a new beast in the Potterverse that’s similar to a werewolf. Newt’s older brother, Theseus Scamander (Callum Turner), and his fiancée, Leta Lestrange (Zoë Kravitz) also make an appearance. The globetrotting adventure will see its characters in New York, London, and Paris, so it’s time to start getting excited. Fantastic Beasts: The Crimes of Grindelwald will be released on November 16, 2017.